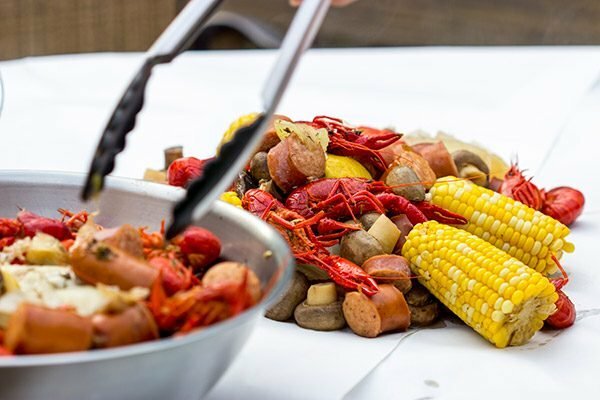 I’ve partnered with SocialStars and Johnsonville to share this Cajun Crawfish Boil. 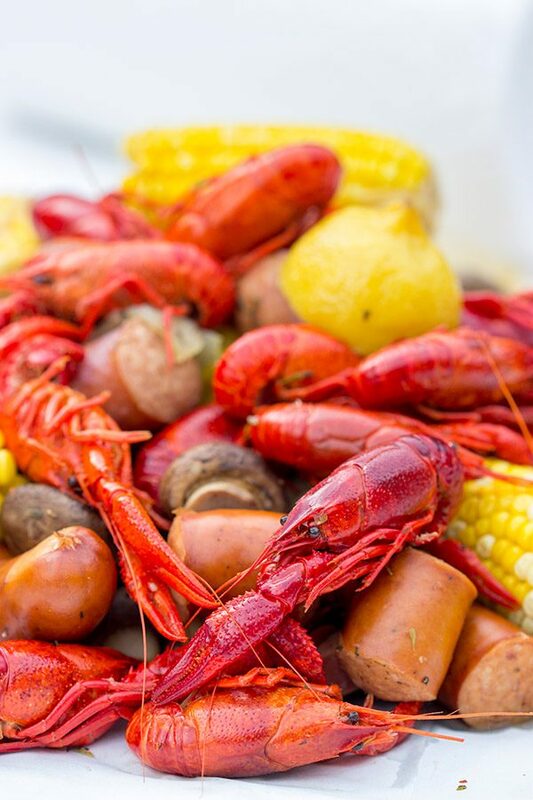 Head to the backyard this weekend and host a Cajun Crawfish Boil with friends! When my wife heard the news that she got a job in upstate New York, I was happy for her! But then about 4.3 seconds later, it hit me. Upstate New York? Huh? Isn’t it cold up there? The thought of moving way up north was a bit much for this southern boy. I was born in Texas, raised in the Carolinas and then spent time in Louisiana and Georgia. The southeast is my home! Err, was my home. In addition to that truck, our cars were also packed to the brim with clothes, dogs and other random things. Like an ice chest full of Cajun meat. Yup, that’s right. Before we left Atlanta, I visited a Cajun meat market and stocked up on all of my favorites. Andouille sausage, crawfish tails, boudin, alligator, tasso. I knew I wouldn’t be able to find these up north, so I brought ’em with me! I saved them in my freezer up here and rationed ’em out very slowly. I love a good Cajun crawfish boil! 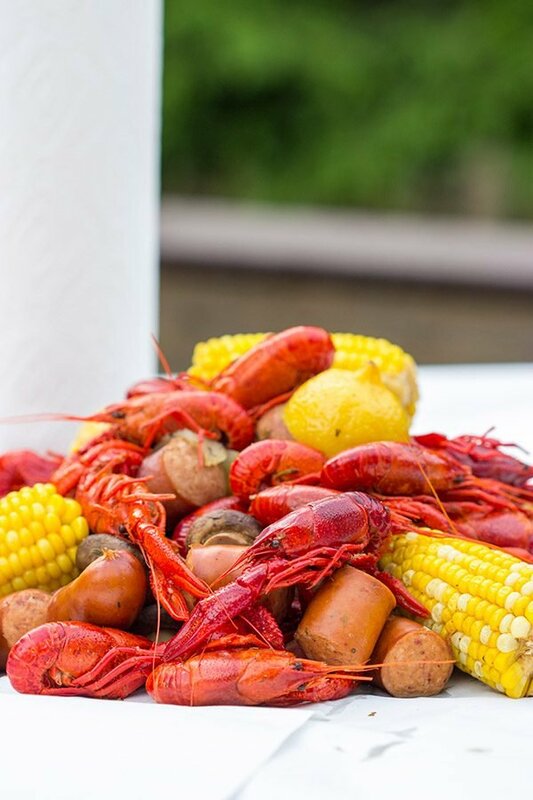 Have you guys ever been to a crawfish boil? They’re usually held outdoors in the early-mid summer, and they’re a great excuse to hang out with friends and eat good food. I’d never eaten crawfish before moving to Louisiana, but I got the hang of it pretty quickly. However, truth be told, my favorite part of a crawfish boil is all of the other stuff that goes in the pot with the crawfish. Like sausage. And corn. And mushrooms. And potatoes. They all soak up the seasoning in the water, and they’re seriously tasty! 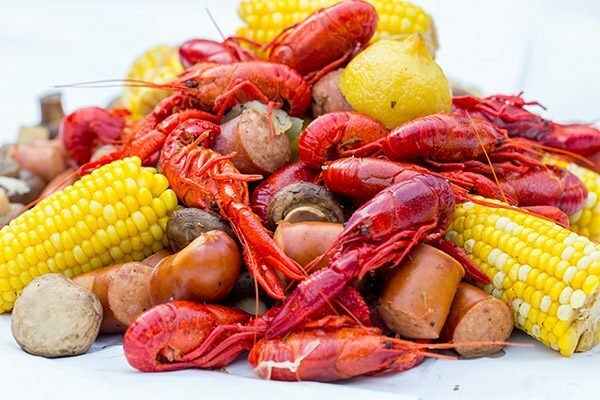 A couple of weeks ago, Laura noticed that a local restaurant was hosting a crawfish boil on Memorial Day. Say what!? A crawfish boil in upstate New York? Sure enough. It turns out the chef has some Louisiana roots, and he flies crawfish up for a Memorial Day boil every year. How did it take me 6 years to hear about this?? Of course we went and enjoyed crawfish on Memorial Day…and it was awesome! But all it made me do is want more crawfish. So I decided to do my own Cajun crawfish boil…right in my backyard! While I still can’t find alligator or boudin (or turduckens, for that matter) up here, I was lucky enough to stumble across Johnsonville Naturals Andouille Sausage. 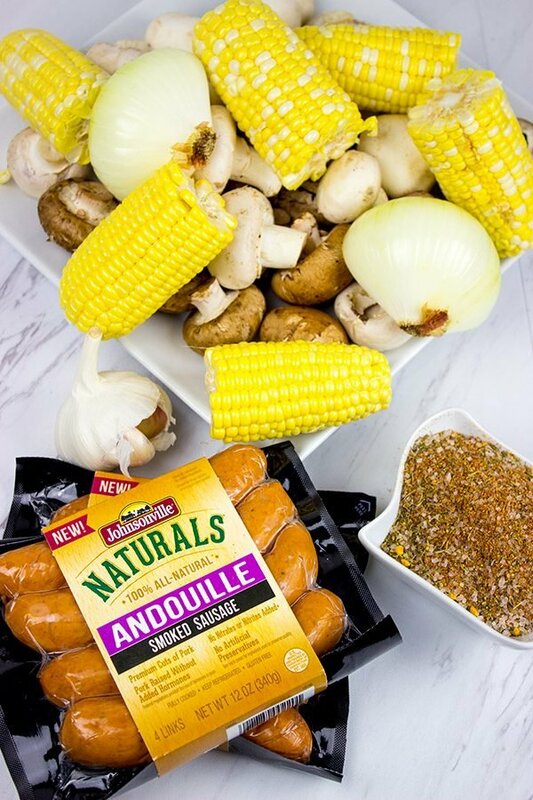 Andouille is a style of smoked sausage made with Cajun seasonings…and it’s a requirement for crawfish boils! Another requirement for crawfish boils: crawfish. I wasn’t sure if I could find crawfish up here, but I managed to find whole frozen crawfish at one of our local grocery stores. They weren’t the traditional live crawfish, and they weren’t from Louisiana. But you know what? Sometimes you just gotta make do with what you’ve got. So those crawfish landed in my cart and off I went to my backyard. Our Cajun crawfish boil was a success! The sausage and corn was the first to disappear…no surprise there! I’m actually now thinking about hosting a yearly crawfish boil in our backyard. I’ll need to find a better source for crawfish, but I’ve got the andouille sausage covered thanks to Johnsonville! 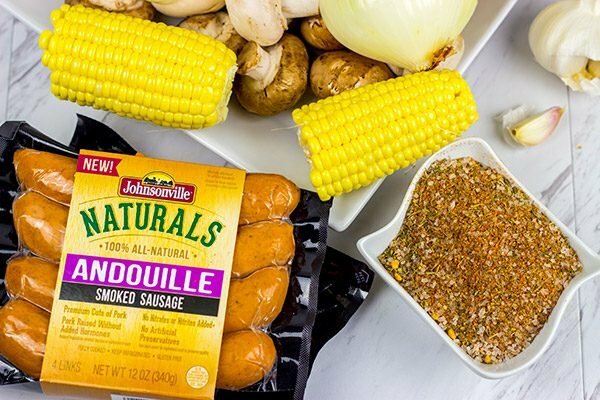 Johnsonville’s Andouille Smoked Sausage is part of their new line of Natural Brats. (This line, which also includes White Cheddar Smoked Sausage and Jalapeno Cheddar Smoked Sausage contains no MSG, trans fat or fillers.) 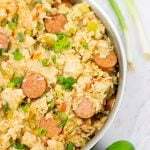 Andouille sausage is great just by itself on the grill, but I typically save it for my favorite Cajun recipes. Like this Cajun crawfish boil. Or these Red Beans & Rice. Or this Dirty Rice. If there’s one thing you can always count on finding in my freezer, it’s andouille sausage. That and ice cream. Enjoy! Once seasoned water comes to a boil, add lemons, potatoes and garlic. Reduce heat to simmer and cook for for 6-8 minutes. Add onions, corn, sausage and mushrooms. Cover and let simmer for 15 minutes. If using fresh crawfish, make sure to rinse them first. After adding, let water return to a boil. Boil for 2-3 minutes, and then turn flame off. Let crawfish sit in the hot water for ~15 minutes. Plan on 2-3 pounds of crawfish per person. 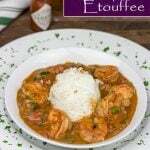 You can easily increase the amount of crawfish in this recipe without changing the amount of seasonings in the water. Hah! You’re right…I should have included instructions for actually eating the crawfish. But I’m not sure I have enough space for that! 🙂 Just kidding…crawfish are actually pretty easy to eat once you get the hang of it. One of my buddies described them as similar to peel and eat shrimp with a harder shell. I imagined your car full of meas, and that image was quite hilarious (I might have exaggerated a bit. ):) Indeed, we may leave Ontario sooner or later – we’d love to live in a smaller and colder place. Well, do you think I should start buying lavender for that day? :) I know nothing about the South cousin, but this bowl seems to be very delicious and packed with flavors! Well done! Hey, you probably didn’t exaggerate that much, Ben! We had a huge cooler packed with meat. And of course, we had to bring it in each night and repack the ice, etc. It wasn’t easy…but it was totally worth it! Wait, did I just read that correctly? You want to move somewhere colder!?! You should definitely start stockpiling lavender for that day…you don’t want to run out! That’s so cool y’all found a restaurant close by that has a crawfish boil once a year – maybe the chef might increase it to more times if everyone chokes that joint on memorial day?! BTW – wonder if I can sneak crawfish by customs when we head up North this summer??? Oh man, I miss the crawfish boils down south! There was always a huge crawfish boil in the Virginia Highlands every year…and that was one of my favorite springtime traditions in Atlanta! Love the story of you moving to Upstate New York – had to giggle about your motorway experience 😉 It is important to stuck up on favourites – moving is exciting and stressful at the same time and a little bit of comfort food makes a big difference! 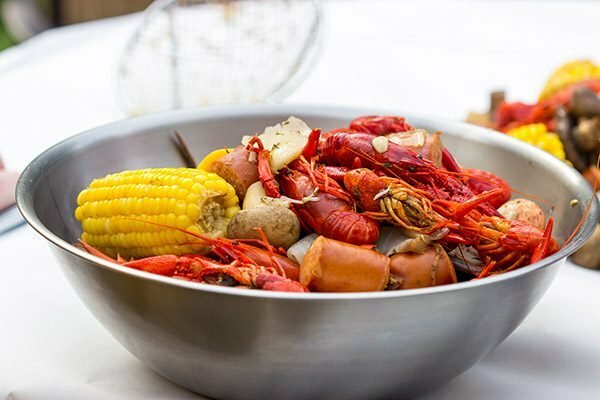 Never been to a crawfish boil – sounds like a lovely way to spend time with friends while enjoying good food! That, my friend, is priorities 😀 Haha! This was on my foodie bucket list (or any broil, rather!) and missed out so I’m drooling at 9am right now. It’s got all my favorites in one! Now as for the restaurant, I think I’ll come visit around that day and starve. Crawfish is a unique thing, Smitha…and you can pretty much only find it in the south here in the States. I didn’t know about crawfish boils until I moved to Louisiana in my early 20’s…but now I’m hooked! Definitely put this one on your foodie bucket list! Crawfish is near and dear to my heart, Kevin! I can’t get live crawfish up here in New York, but I’m determined to figure out how to host crawfish boils in my backyard every year! Stay tuned! 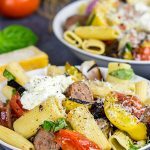 This recipe is like the “hello” to summer!! …Andouille sausage, crawfish tails, boudin, alligator, tasso … it’s all so foreign! Are there any foods that northerners eat that seem bizarre to you? Hmmm…that’s a good question, Jeff! Around here, it’s heavily Italian, and I love Italian so that’s not a bizarre thing at all. I’d say perhaps clam chowder. I love chowders, but I’m not a huge fan of clams…so that one is a little off to me. And maybe some of the NY deli sandwiches, although NYC stands in a category by itself when it comes to food. Good question, though! Just found your site and I’m enjoying it! Tony’s Seafood in Baton Rouge ships seafood (and their boudin is to die for). Also Jacobs World Famous Sausage in Laplace ships. Their tasso is delicious. Your crawfish looks tasty. Once the season starts we eat crawfish every week until it’s over, but we do 5 lbs per person. This year we quit boiling it ourselves and started picking it up at the local Winn Dixie (no mess for the win!). They serve up a delicious boiled crawfish, who knew? I miss the sausage, garlic, and mushrooms but you can’t have everything!